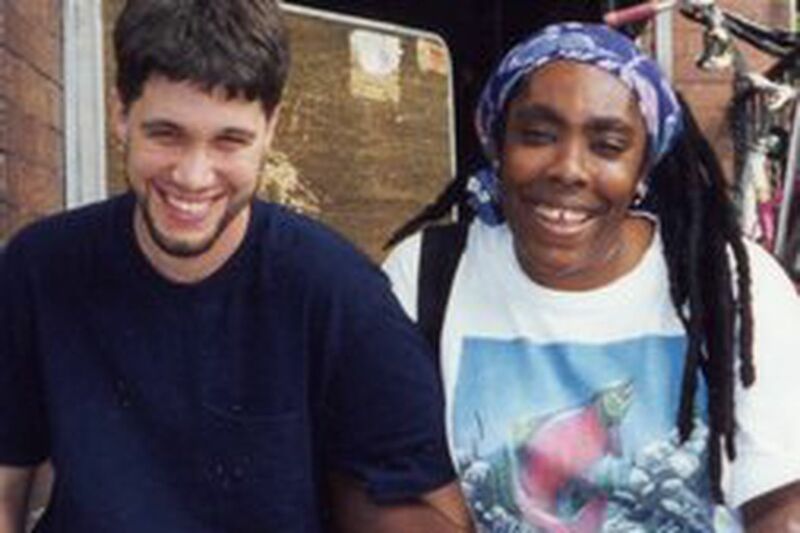 Tony Allen with Ramona Africa during his time as a MOVE supporter. He now blogs from North Carolina. Fraternal Order of Police president Bobby Eddis praising former MOVE supporter Tony Allen as a good guy? Conservative talk-show host Michael Smerconish seeking the onetime adversary's expertise on a book project? Eddis and Smerconish never expected this. Neither did Allen. But strange things happen when you break free from a cop-hating cult and start making amends in a public way. As Eddis puts it: "The world changes every day." And thanks to the Internet, a North Carolina drugstore manager's devotion of a few hours a week to a blog and Web site can lead to a national effort to stop New York from naming a street after Mumia Abu-Jamal and get parties for MOVE and the convicted cop-killer canceled. "I just put the stuff on the Web," he says. "It goes where it goes." Blogging criticism of MOVE and the campaign to free Abu-Jamal, he says, is merely "an extension of my view of injustice." It's a view that has changed radically since his days as a radical. Allen spent his 20s spewing revolutionary bile for MOVE and its hero, Abu-Jamal, who was convicted of the 1981 murder of Philadelphia Police Officer Daniel Faulkner. For a while, Allen even lived in a MOVE house in Chester with "Minister of Information" Ramona Africa. I met him as he plotted to leave the group, fueled by suspicion and fear after the 2002 murder of John Gilbride, ex-husband of MOVE matriarch Alberta Africa. Gilbride was fighting for custody of his son at the time he was shot to death. His murder, hours before his first solo visit with his son, remains unsolved. In 2004, Allen told his story and moved to North Carolina, launching a Web site (http:// themoveorganization.com/) and blog (www.antimove.blogspot. com), debunking MOVE and Abu-Jamal supporters. "What motivates me is to right something not that I feel is wrong, but that I know is wrong, to help other people not fall in the same trap," Allen told me for a column in 2005. I figured he'd post a few mea culpas and move on. He's still typing. In January, Allen, now 30, noticed a petition drive to get a street named after Abu-Jamal in Harlem. This struck Allen as ridiculous, because "Mumia is not even from there, and the idea of naming a street after a convicted murderer shows how absurd his supporters are." Allen blogged about it and launched a counter-petition on his site and www.danielfaulkner.com, where he posts frequently as "PhillyExile." In two days, he had 700 signatures. In two weeks, 25,000. Mumia Street hit a dead end. Last month, Allen blogged about plans for benefits for the "MOVE 9" and Abu-Jamal in New York and Philadelphia. Amid protests from his readers - including many outraged police officers - both venues pulled the plug. Eddis and Smerconish praise Allen, whom they haven't met. "He could have done one thing and bowed out," Eddis said. "He's lived up to his promise. Not a lot of people do." Smerconish has had Allen on the air and has interviewed him for a book he's writing with Faulkner's widow, Maureen. "He's provided me with insight into how she was vilified by the MOVE organization," Smerconish said. "He was knee-deep in their shenanigans." Today, Allen lives to expose them. "Anyone paying attention at all to the 'Free Mumia' movement lately could not miss all of the self-pitying, hyperbolic whining, about the fact that the Philadelphia FOP have chosen to quietly demonstrate against Mumia's birthday party," Allen blogged last week. "Someone apparently forgot to remind the Jamal supporters that the First Amendment was not just written for them and their cop-killing hero." It's good stuff, I tell him. What blogs are all about. Allen again demurs, saying he's just one guy with a narrow niche doing his thing in the vastness of the Web. "My conscience is clear," he says. And his computer is on. Contact Monica Yant Kinney at 215-854-4670 or myant@phillynews.com. Read her recent work at http://go.philly.com/yantkinney.